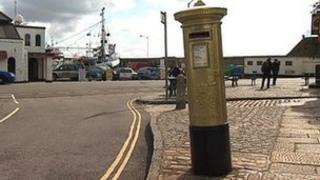 Image caption The King George VI post box in Penzance was chosen as it is one of Royal Mail's oldest. A Royal Mail post box has been painted gold in a west Cornwall town in honour of Olympic gold medal winner Helen Glover for her achievement in rowing. Every time a British athlete wins a gold medal in the Olympics or Paralympics, Royal Mail will paint a post box gold in their home town. Although she now lives in Caversham, near Reading, Miss Glover, started her sporting rise to fame in Penzance. Miss Glover said: "Is that really happening? That is so, so exciting." "It's great that it's happening to my home town, it's just really nice to be able to give a little bit of excitement back, because I want everyone to feel like they're part of it, because they are," she added. Helen Glover, 26, and rowing partner Heather Stanning took gold on Wednesday in the Olympic rowing pairs final, winning Britain's first gold medal of the 2012 Games and Britain's first by women rowers. Heulyn Davies, from Royal Mail, said: "We wanted something to mark what is obviously a wonderful occasion for Helen Glover and for Penzance of course and for all Olympians who win a gold medal for team GB." The King George VI painted post box - one of Royal Mail's oldest - is situated on Quay Street opposite Penzance harbour and will remain gold for six months. It is the first time in 140 years the boxes will have changed colour. The post box in Penzance is the first to be painted and Royal Mail hope it will turn out to be the "first of many more to come". Mr Davies added: "Let the gold rush begin." To mark their win, Royal Mail have also printed a stamp depicting the rowing pair.